Lingual braces are an innovative option of dental treatment. In this treatment, the braces are attached to the rear side of the teeth. This way they become completely invisible and non-interfering with person's look. This sophisticated orthodontic treatment is best suited for those adults who want to straighten up their uneven teeth without letting the world know anything about them. The Lingual Braces are a wonderful way to enhance the placement and positioning of teeth without making any obvious declaration of braces being worn by the patient. They are hidden behind the teeth so no one can see you are wearing braces. Same effective results as traditional braces without diminishing the aesthetics of your smile. Strong materials used to minimise breakage and damage. 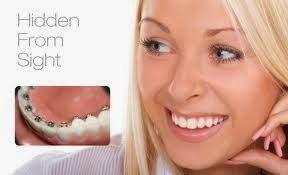 Do you want the benefits of braces without people seeing them? Lingual braces may be the solution for you! At City Dental Centre, we offer lingual braces to those who would prefer a much more discreet option to traditional or even clear braces.